It makes me smile to think that I can close my eyes and remember the moment exactly. At the time, that struck me as a strange motto for a country best known for its zest for life, but I was assured that the sentiment, with its “lofty hyperboles” intact, could be traced back to the poet Johann Wolfgang von Goethe and a journal entry about the city of Naples he wrote in 1787. As I stood contemplating the round robin translation from von Goethe’s original German, to Italian, to French, and finally to English, I knew only that I understood its meaning, deeply and instinctively. I had been to Rome, Florence, and Venice the previous year and I could no more quarrel with the old adage “See Italy and Die” than the generations of other travelers who had been to the Colosseum, the Ponte Vecchio, and Piazza San Marco before me. As melodramatic as it might sound, once I had witnessed the beauty of Italy with my own eyes, and felt myself transformed by it, I knew that was possible for someone to breathe their last, happy and content in the memory of such a place. As I wandered that day through rooms full of Italian photographs, prints, and paintings from the golden age of The Grand Tour—that venerable trek that aristocrats used to make across the European continent—I felt strangely distant from my surroundings. Here I was in Paris, one of the most wonderful cities in the world, but all the while I yearned for the sea and the sunshine of Italy. 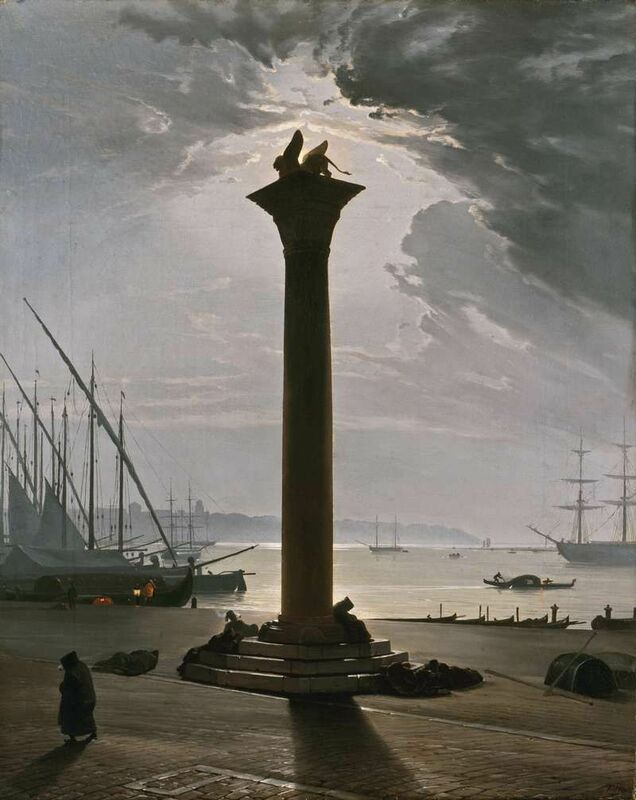 Standing before a Friedrich Nerly painting of Venice in the moonlight, the sky breaking just above the column of St. Mark, I resolved, right then and there, to return. After a few sodden weeks in France, Belgium, and the Netherlands, I came home to Vermont and settled back into the quiet routines of life. I watched the months slip by, as autumn leaves fell and were buried by blankets of soft, white snow. And in the darkest days of winter, I bought a fresh Italian guidebook, sent away for maps, finalized airline and hotel reservations, shopped for a new camera, and prayed that an Icelandic volcano with the unpronounceable name Eyjafjallajökull, wouldn’t ground my best laid plans with its plumes of drifting ash. So now, with the arrival of lilacs and spring irises, it is time to pick up where I once left off, to fulfill a promise, to have an adventure. 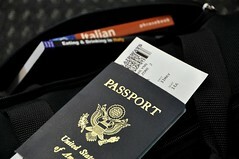 It’s a Monday night and I’m at the Philadelphia International Airport waiting for a U.S. Airways flight to Rome. I bide the time by recounting the plan for the next seventeen days in my head. Itineraries are complicated affairs, the endpoint of a tug of war between reality and desire. I had a long “wish list” for my return to Italy—one that included Da Vinci’s “The Last Supper” in Milan and Giotto’s frescoes in Assisi and Padua, as well as a hike along the cliffs in the Cinque Terre, and a stroll through the villas and gardens that line the shores of Lake Como. Through a herculean effort at planning, I’ve managed to fit nearly everything in, including the timing of several key events—the Republic Day festivities in Rome on June 2nd, a major exhibit of paintings by Caravaggio at the Scuderie del Quirinale, a weekend antiques show in Arezzo, and the procession of the Holy Blood in Orvieto on Corpus Domini. For all of that to happen in an order that works using public trains and buses, this particular Monday night happens to be Memorial Day. While others are grilling hamburgers at backyard picnics, I’m playing musical chairs at the airport, until flight 718 finally settles on Gate A20 and we begin to board. I’m in seat 14A, a window seat next to a globe-trotting Sicilian grandmother named Josephine. She’s a charming woman whose conversation lives up to all that description implies. I find myself enjoying her company, and before long dinner is served and stowed, the cabin lights are dimmed, and passengers are queuing at the restrooms in preparation for bed. I close my eyes in satisfaction, knowing that in the morning I’ll be a world away.